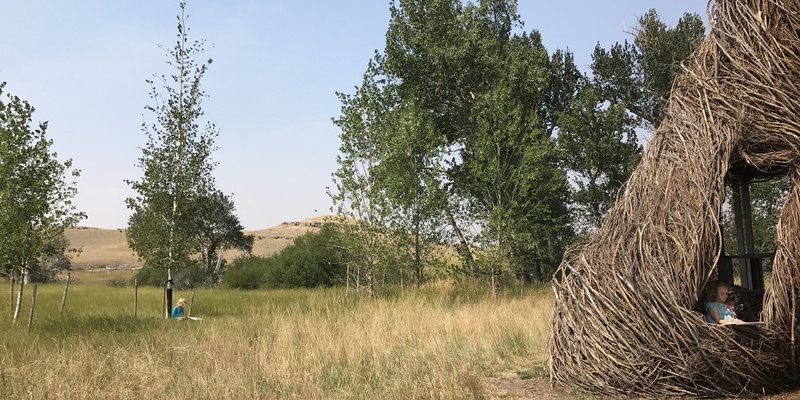 “Whoooooooa!” shouted a group of ten children as they entered Daydreams, the sculpture created for Tippet Rise by the internationally renowned artist Patrick Dougherty. Ranging in age from six to 11, the children wandered about the enormous willow structures woven within and around the weathered clapboard building designed to resemble a frontier-era schoolhouse. “They look like monsters!” said one child about the willow structures. “Friendly monsters!” the two shouted in unison. After trying to guess the building’s age (answers ranged from two to 3,000,000 years old—it was built in 2015), each child found a place to sit, opened their sketchpads, and drew quick, rough outlines of Daydreams. Next, they would use watercolor to complete their works. The group had come to Tippet Rise with the Boys & Girls Club of Carbon County to participate in a watercolor painting workshop led by Jordan Pehler and Berenice Munson from the Yellowstone Art Museum (YAM) in Billings, Montana. One of many workshops offered this season at Tippet Rise, the collaboration between the art center and YAM is part of an ongoing effort to help foster appreciation for art, music, and nature for generations to come. With lively participation from their students, Pehler and Munson opened the workshop by discussing the modernist painter Isabelle Johnson, who once lived on and ranched this very land. And that’s exactly what the children did. Some painted in exuberant, sweeping brushstrokes. Others in tiny, careful dots. Through that warm August afternoon, the children created paintings of three different scenes from the art center. Focused and quiet much of the time, occasionally they paused to listen to Pehler, Munson and Tippet Rise’s Art Education Coordinator Beth Huhtala offer painting tips and techniques. The group also learned that Isabelle was not only a rancher and a respected painter, but also a history teacher. That she earned a bachelor’s degree, in 1922, from the University of Montana and then a master’s degree in art from Columbia University. They even discussed modernism. (“He said it means being a rebel,” giggled one child to another). At the workshop’s end, the children gathered, showed their paintings, and shared what they most enjoyed about the day. “I liked going to Daydreams,” said one girl. “I liked painting the texture of the grass,” said another.